Our Colors of Ayutthaya bicycle tour is a relaxed bicycle ride through the suburbs of Ayutthaya City and through the historical park and ruins of the old capital. The excursion starts once a day, 10:00 hrs in the morning, from our office/meeting point on walking distance from Ayutthaya train station and finishes around 16:00-16:30 hrs at the same place. After selecting the bicycle and a quick bike fitting we start the Ayutthaya bicycle tour from our office and follow the road in northern direction through idyllic villages, along rice paddies, visit a local elementary school (if open) to interact with the children. We continue the ride and pass Phaniat Royal Elephant Kraal. During Ayutthaya’s heyday this structure was used to entrap wild elephants herded down from the north. The elephant round-ups in the Elephant Kraal were traditionally presided over by Ayutthaya kings who would choose the best and strongest elephants that would be trained for war and labor. The closer we get to the old capital the more ruins of temples we see along the way. Around 12:30 hrs we will have a Thai lunch at a riverside restaurant. After lunch we enter the old capital and visit Wat Mahathat, Wat Pra Sri Sanphet and explain you about the history of Ayutthaya and its temples and kings. We continue the Colors of Ayutthaya bicycle tour with a short ride over a local market where typical local delicacies are baked, fried, sold and consumed. Not far from the market we make a stop at the huge reclining Buddha, the biggest one in Ayutthaya, at Luang Phor Lokayasuttha. After we all have taken some pictures of this huge Buddha we continue our ride to another remarkable and beautiful temple on the west riverbank of the Chao Phraya river, Wat Chai Wattanaram. This temple was constructed in 1630 by King Prasat Thong as a memorial of his mother’s residence in that area. After this impressive temple we continue our ride along the west bank of the Chao Phraya river until we reach the pier to cross the river again back to the city and finish the tour at our office. If you like to ride a bicycle through the countryside and historical city of Ayutthaya this day trip, filled with rich cultural interest will adds lot of value to your stay in Thailand. NOTE: Since you will visit ancient temples, you are expected to dress respectfully. We recommend you to wear longer shorts (knees covered) and to have your shoulders covered when we enter the temples. Ayutthaya City Culture, an enjoyable bicycle excursion in the ancient capital of Siam, Ayutthaya. During this bicycle tour we cycle through local communities, along markets and stop at some of Ayutthaya’s most famous temples. 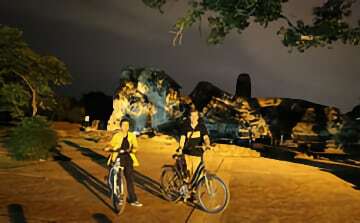 Ayutthaya Sunset Ride is a 3-4 hour bicycle excursion through ‘Ayutthaya by night’. Somehow all the temples seem to be more magical at night and this tour gives participants a very different perspective on the ruined temples. Ayutthaya Sunset Ride is a must-do experience!